Did you know that there are different types of honey? The type of honey is determined by what plant the honeybees gathered the nectar from. This is because the nectar varies from one plant to another, which gives us many types of honey. 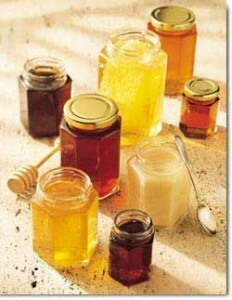 In fact there are over 300 types of honey in the United States and about 3,000 worldwide!!! Liquid, comb, and creamed honey! Honey ranges in color from water white to black, and the darker the color the more robust the flavor. Buckwheat honey, which is a very dark honey and has a strong flavor, is used by many people to sweeten their tea or coffee; whereas clover honey, which has a milder flavor, is used by many people for baking. Honey not only ranges in color but it also comes in more than one form. Extracted honey or liquid honey is what you would find in the grocery store. Comb honey, which is honey still inside the beeswax, is great when chewed like gum. Creamed honey has been crystallized in a controlled process, leading to a smooth and creamy honey that is great spread on biscuits and toast.